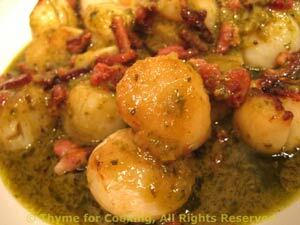 Scallops in Sherry Pesto Sauce, Thyme for Cooking easy gourmet dinner. Fresh scallops are very expensive here, so I get frozen, without coral (which is cheaper, and I don't really care for the coral). If you use frozen, rinse lightly in warm water, making certain they are separate, then let them thaw a bit on a plate, not touching. Add bacon and fry until crisp. Remove bacon. Add scallops and quickly sauté, turning once, until opaque. If there is a lot of liquid from the scallops, drain (a bit is okay). 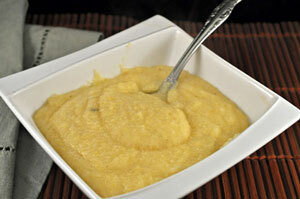 Reduce heat to low and add sherry, stirring to get up any browned bits. Remove from heat and stir in pesto. Add bacon, stir to combine and serve. Another of those fleeting spring vegetables. Some say they are best eaten while standing in the garden and pulling them off the vine. This is second best. Clean pea pods - snip off the stem end. 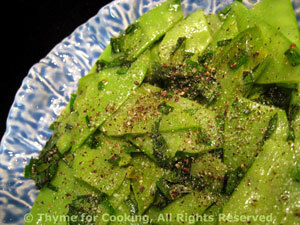 Add pea pods, chives, and sauté 5 - 10 minutes, depending on size, stirring frequently. Taste, when they are done to your liking, remove, add salt and pepper and serve.